Are you ready for the only thing better than Duff, itself?! Duffman understands your confusion, since what could be better than an ice cold Duff?! How about actually being Duffman in this official Simpsons Duffman Costume? Oh Yeah! Duffman loves nothing more than being the spokesperson for refreshing, high quality Duff Beer. One might even say that Duffman loves it so much that he sleeps in his Duff suit, which he is contractually obligated to do! But promoting the smooth taste of Duff means his plate gets pretty full, and Duffman could use a little help from time to time. That's why Duffman wants YOU to help him, by dressing up just like him! Though be warned, valued Duff consumer, there is more to being Duffman than just wearing this costume. You have to be prepared to do whatever it takes to spread the deliciously malty good word of Duff, whether by partying on a space station, or pelvic thrusting for up to six hours straight at a Springfield Isotopes game! You also have to work Duff-related puns into at least 40% of everything you say. It's a “Duff” job, but someone's gotta Duff it! 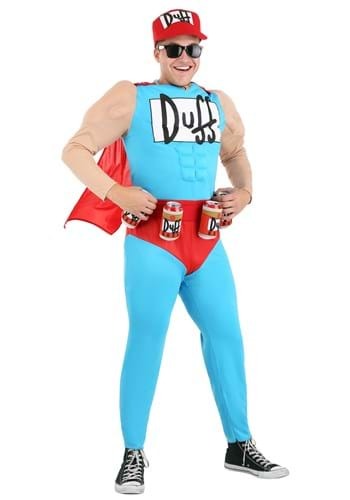 Since this costume is officially licensed, you don't have to worry about looking like anything less than the real Duffman! The bodysuit even comes with its own muscly arms and abs, so you have the right toned physique that only the crisp taste of Duff can give you. Flip on the included Duff-branded hat and a pair of sunglasses (or beer goggles), and get ready to shake your Duff and par-tay! Oooooh Yeah!! !